Laura Bennett gets a hug from her son, Mark '13, during Homecoming/Family Weekend. Laura and her husband Paul '75 visited campus from Oakland, Calif.
More than 2,200 students, alumni, parents, friends and family attended Homecoming/Family Weekend activities Nov. 4-6. Campus guests participated in numerous academic, cultural and athletic events while reconnecting with Wesleyan and with each other at a host of special seminars and social gatherings. Key events this year included the homecoming football game against Williams College; a celebration of Alvin Lucier, the John Spencer Camp Professor of Music, emeritus; a Randy Newman P’14 benefit concert; a Homecoming Day Lunch, Fall Harvest Brunch and All-College Dinner; an Athletics Hall of Fame induction ceremony; Patricelli Center for Social Entrepreneurship Ribbon Cutting; the 19th Annual Dwight L. Greene Symposium, and Where on Earth are We Going? Symposium. A few photos of HCFW 2011 are below. Others can be seen in the HCFW 2011 photo gallery, hosted by Flickr. No. 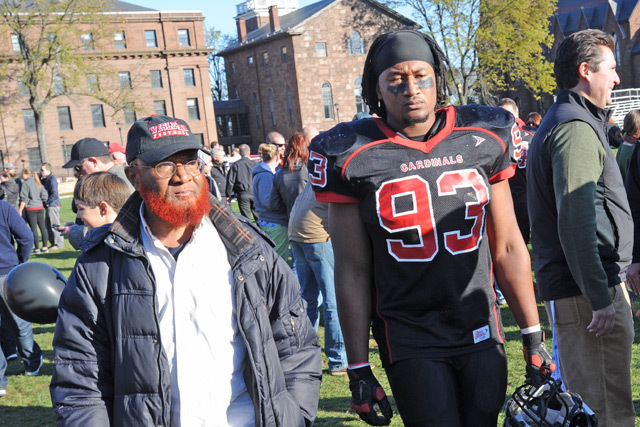 93 Ibraheem Khadar '15 prepares for the homecoming football game against Williams College on Nov. 5. Shirley and David Jenkins of Duxbury, Mass. 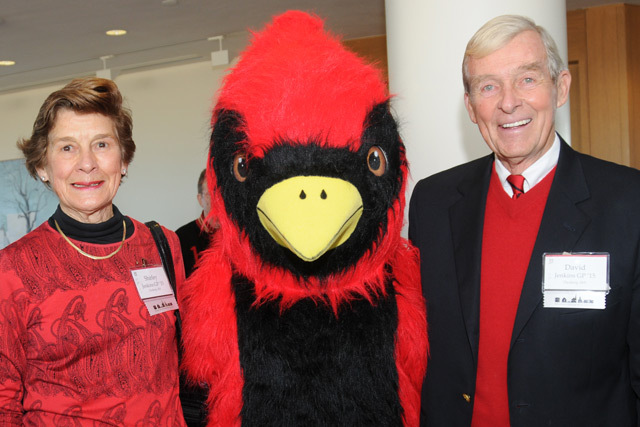 met the Wesleyan Cardinal during Homecoming/Family Weekend. They spent the weekend with their granddaughter, Hannah Jenkins '15. 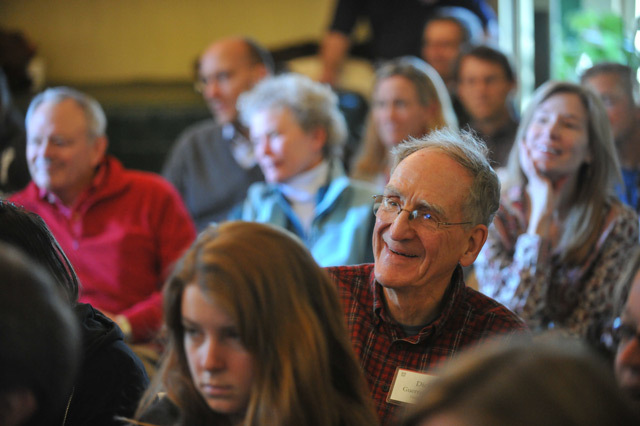 Campus guests enjoy a WESeminar titled "Celebrating 50 Years of the Peace Corps." More than 200 Wesleyan alumni have served their country in the cause of peace. Panelists shared their experiences as volunteers who have worked on issues related to health, education and the environment. 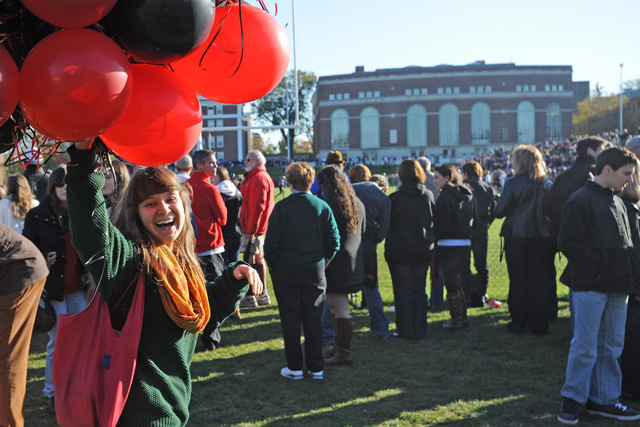 Red and black balloons at the Homecoming football game. 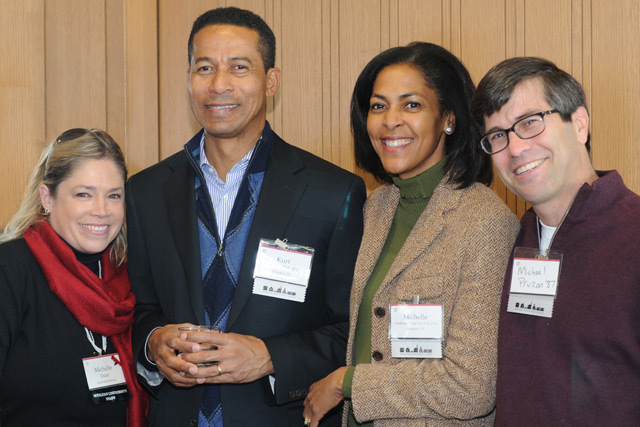 Michelle Dube, development officer in University Relations, mingles with Kurt Lyn '87, P'12, P'15; Michelle Lyn '84, P'12, P'15; and Michael Pruzan '87 at the Donor Associates Reception, Nov. 5. 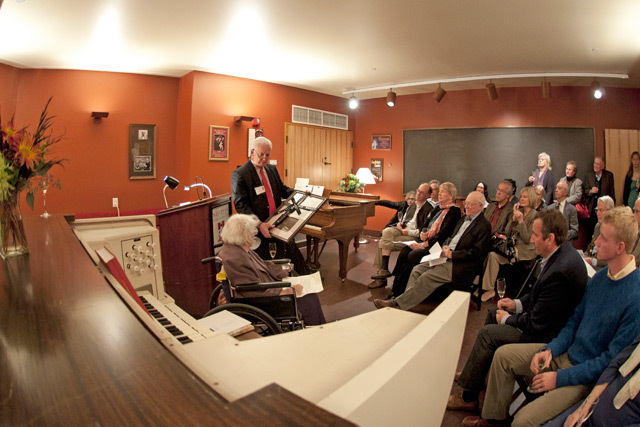 Wesleyan dedicated the Daltry Piano Nov. 6 in Memorial Chapel. The Daltry Piano is a gift from Marjorie R. Daltry Rosenbaum, in memory of Joseph Samuel Daltry. Joseph Daltry was Wesleyan’s first professor of music, founder of the Music Department, university organist, and the inaugural John Spencer Camp Professor of Music. Pictured, John Driscoll, alumni director in University Relations, presents Rosenbaum with a plaque during the dedication ceremony. 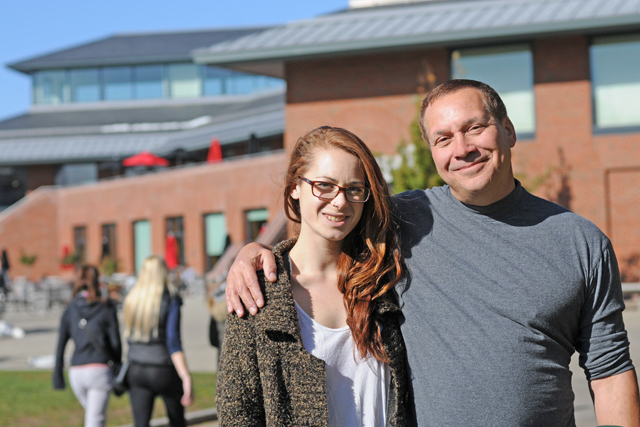 Simone Hyman ‘15 spent Homecoming/Family Weekend with her father, Harvey Hyman. Harvey flew to Connecticut from Berkley, Calif. on Nov. 3. 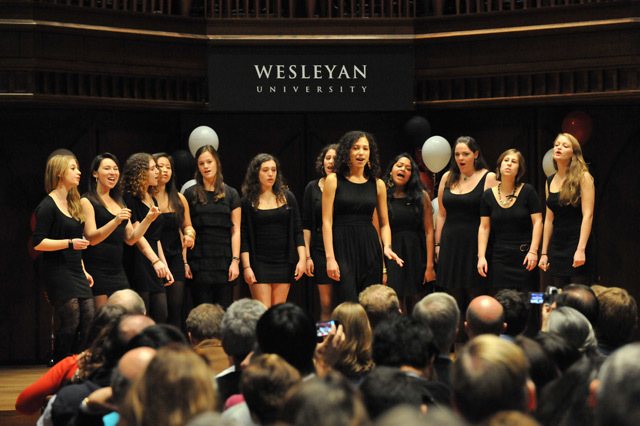 Wesleyan undergraduates presented the First Annual Stone A Cappella Concert Nov. 6. The event was sponsored by the Charles B. Stone, Jr. A Cappella Fund. The Charles B. Stone, Jr. A Cappella Fund was established through the generosity of Sarah Stone Maynard ’79, P’11 and Fred Maynard ’80, P’11 in honor of Sarah’s father, Chip Stone ’49, P’79, P’82, GP’11, GP’15, and in celebration of the Stone family’s long Wesleyan legacy. Once called the “singing college of New England,” Wesleyan still boasts a strong musical tradition. 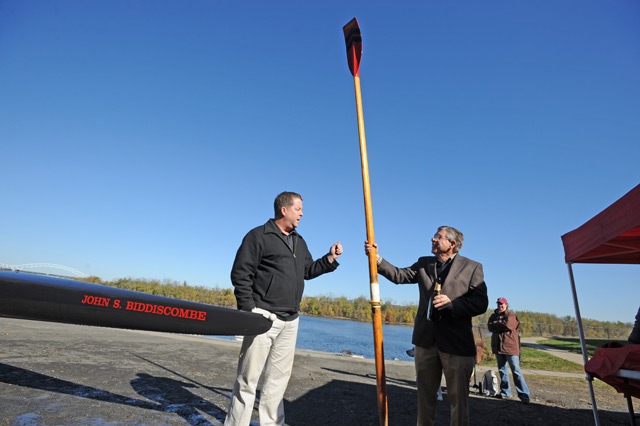 Phil Carney, head coach of men's crew, dedicates a Wesleyan crew boat to John Biddiscombe, director of athletics, during a ceremony on Nov. 5 Biddiscombe, who formerly coached football, wrestling, track and field, is retiring this year after 37 years at Wesleyan. Biddiscombe oversaw the development of the Freeman Athletic Center, one of the premier athletic facilities in New England. Alumni who are parents and grandparents of current first-year students were invited, along with their children, to be part of the 2011 legacy photograph for Wesleyan magazine. The group met on Denison Terrace Nov. 6.